Bak Kut Teh has become something that is quite prominent in our country over the years and once this was a poor mans dish to keep him healthy so that he would not have to get sick miss work or even go to the hospital, it has evolved over time as an institution much like Nasi Lemak, Nasi Beriani and other famous Malaysian Favorites. I have not eaten Bak Kut Teh in a restaurant for many many years. I have taken away once or twice because many years ago there was a Bak Kut Teh seller just 50 metres from where I lived but then he went somewhere else so I never bought it again. Time and time again my mother will make it and while home cooked, is flavorsome and all you can eat, somehow it does lack a certain something. In fact I must say the last time I had Bak Kut Teh was with my dad when I was 11. And back then I remember clearly it was RM4.50 per bowl and dad would go on about how it used to be 80 cents when he was young. Dad always compares prices from when he was really young. So today, after Skytrex, Poh Leng, Chia Chen, Dan and myself suddenly brought on the topic of Bak Kut Teh. I think it was I who brought it up, since we were at Shah Alam, and quite close to Klang which is famous for its Bak Kut Teh, although I have never tasted it in my life. Dan backed out because he had to go out with his family. I believe he was just being lazy, because he did say there was a shop near his home that served good Bak Kut Teh. So we decided to go for dinner. So at 6.30 pm, I got picked up by Chia Chen and then we went to pick up Poh Leng and off we went, looking for Bak Kut Teh, when Chia Chen suggested Heng Kee Bak Kut Teh. When we got there, it was chockers. It was 7 pm and it was full, we had to wait for our table, as we looked around and noticed the 40 to 50 odd tables was laden with the same food. Bak Kut Teh and its accompaniments. We waited, almost 20 minutes before we got a place near a gate, and then we waited for again for the table to be cleaned up. Then we waited to get someone’s attention to take our order, and then we waited for our food, and waited again for the rest of our food to come. It was total waiting in anticipation I must say. We were all so ready to TUCK IN! Then Chilly and Garlic came with the drinks. Garlic was chopped up obviously taken from another persons table and plonked onto ours. I am sure this is the story of the chilly as well. Drink was too hot and too sweet, so we had to alight a waiter again. Then the vegetable dish arrived. 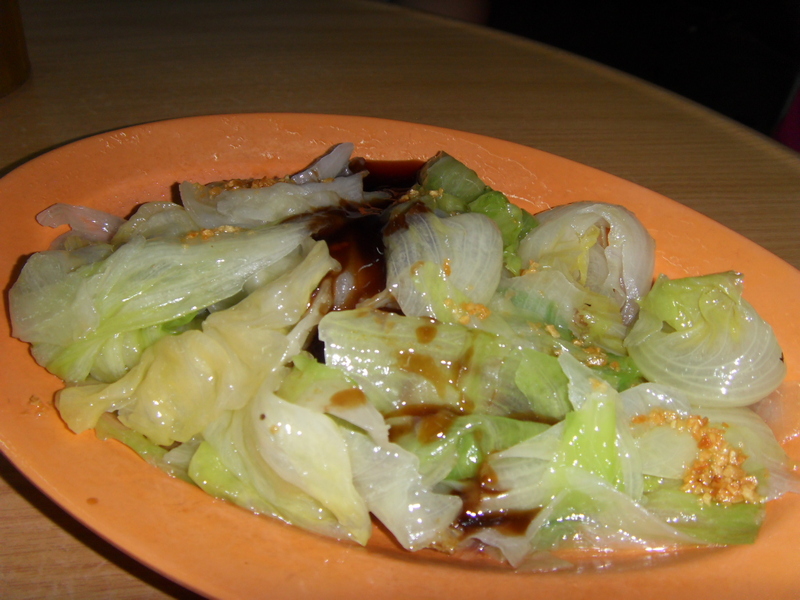 Blanched Lettuce Leaves tossed in oil, garlic , oyster sauce and soy sauce. Simple and nice. Oily though. 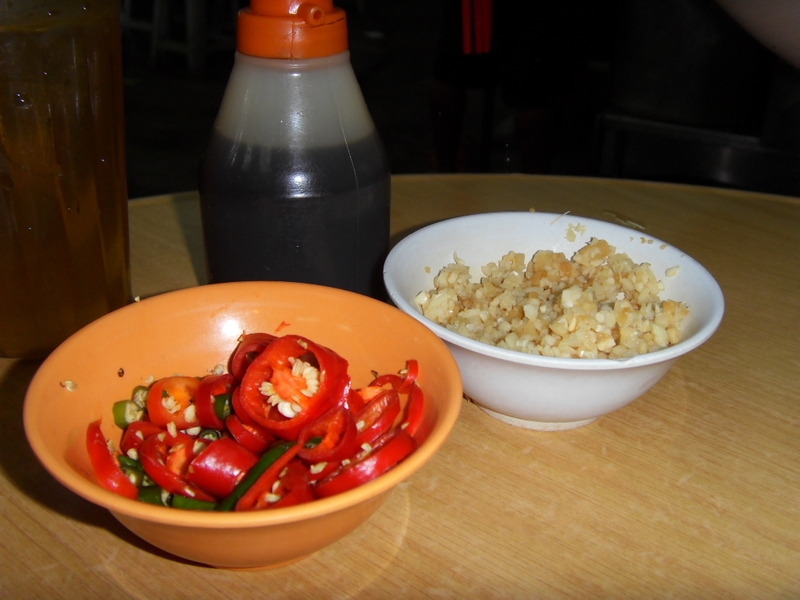 Then the Tau Pok (Tofu Puffs) and Mushrooms arrived with our steaming rice. Meats arrived, we had a bowl of meat and another bowl of offal. So finally our wait was over. Now all this with years of anticipation of not having eaten Bak Kut Teh, and coming to a place that was so crowded, and my verdict, it was nothing much at all. For one the soup was too salty. Then I found the meat was cooked separately from the soup before it was reboiled so now we had a piece or pieces of meat that did not really absorb the flavors of the herbs and spices. The flavors did not infuse well. And what’s worst was, the soup lacked the herb and spice flavors of the Bak Kut Teh I always knew. I think this is a sad thing because being non Chinese and still having lingering memories of what good Bak Kut Teh was all about, it was disappointing. In a way it was like I was cheated, but then again, the huge crowd did not seem to mind. Where has their taste buds gone? There were many older people around whom I am sure have eaten better, and yet they were happily tucking in. Even the rice was nothing much. 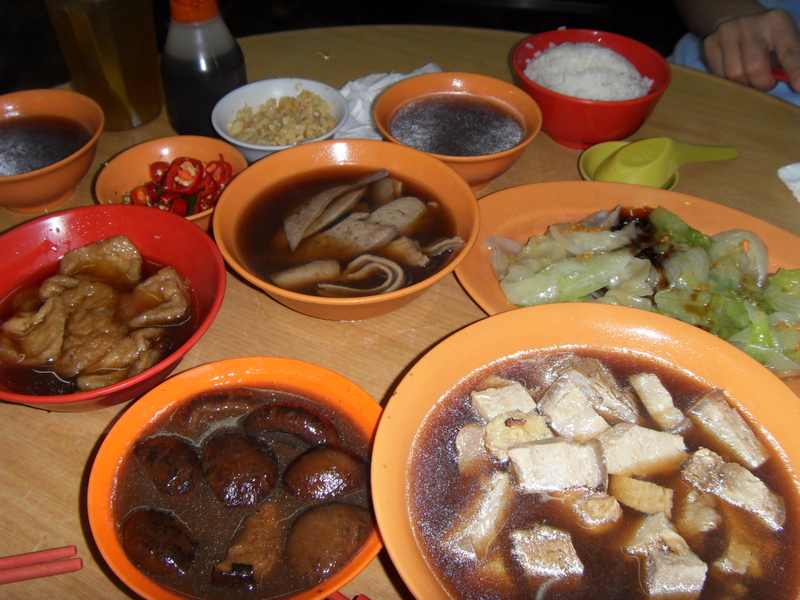 What is Bak Kut Teh? Bak Kut Teh, to me is pork bones and meat cooked for hours over a simmering stove or better still a charcoal burner and it is infused with herbs and spices you buy from the Chinese Medicine Shop. And then after a few hours of simmering it, you eat it with nice flavored rice. When I lived in Australia we used to go to the Asian Grocery Store and buy the little sachets of Bak Kut Teh Spices. It was a little cloth bouquet garni filled with all the ingredients needed. I would cook it with Tau Pok, and Mushrooms and boiled eggs which will have the distinct flavor of tea eggs. And if we were lucky, we’d find Yau Char Kueh (Crispy Crullers) and it would be nostalgic. 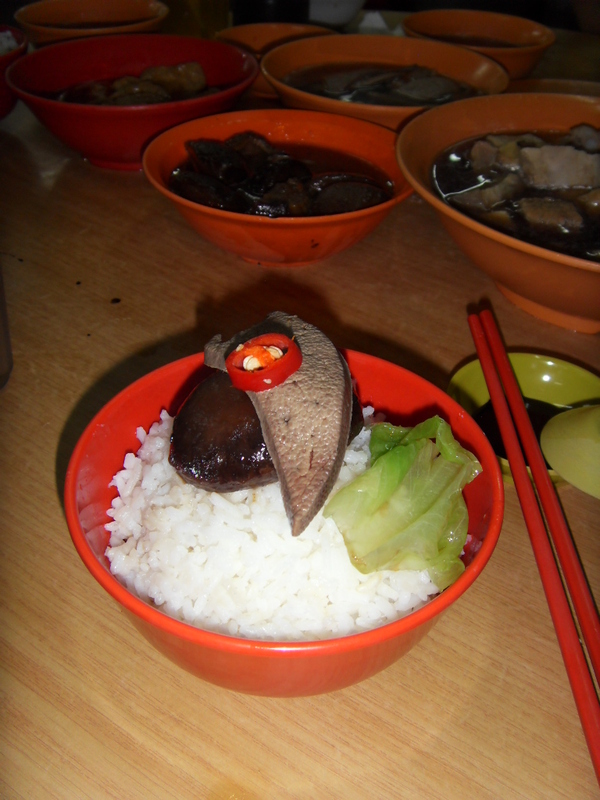 mushrooms were nice and succulent, while the tau pok which is usually a favorite of mine was not flavorsome enough for me. We ate up everything, I had good company so that made up for the average Bak Kut Teh I had that day. Maybe it was a busy day and they had move customers then anticipated and had to resort to cooking the meat separately, but still I believe in pride when cooking something that is an institution in this country. 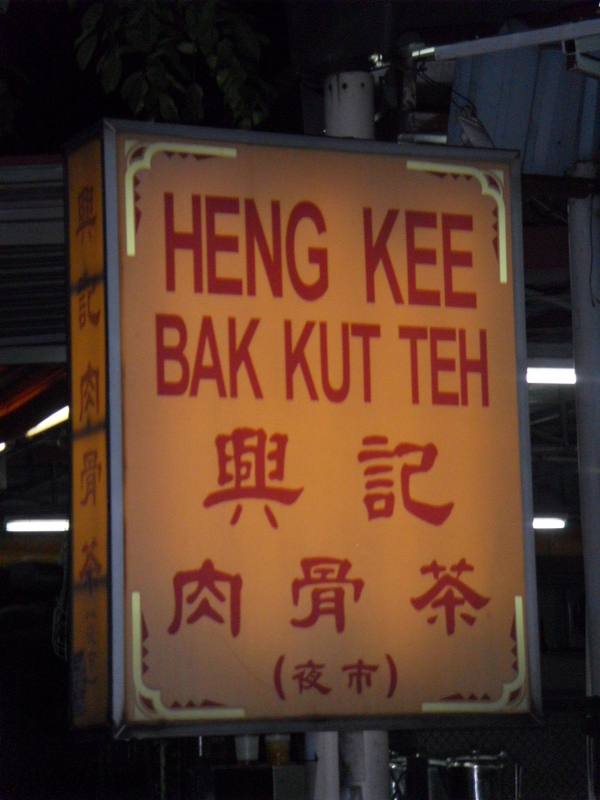 I would like to try the Kepong Bak Kut Teh that Dan has mentioned. Maybe it will take me back to the time when Dad took me out for that morning Bak Kut Teh. Total price spent was $53. Whether it was worthwhile, well I cannot say it was. Totally zero ambiance, the heat, the noisiness, the service, the waiting, and then the so so meal. While some would say this is the typical Malaysian food scene for most Malaysians, I think once again pride of serving good food is important. Thank goodness, Chia Chen and Poh Leng had heaps to talk about. That made the meal more memorable.